What Do You Do With A Cashbox Company? A company’s worth consists of the value of its operations, plus the value of any non-operating assets, such as excess cash or unused real estate. Most public companies do not hold significant excess assets. Ranks of activist investors stand ready to force companies to invest excess capital productively or else return it to shareholders. But what about the exceptions? I know of several unlisted companies that hold cash and securities worth much more than their actual operations. How should these companies be valued by investors? The answer depends on who’s asking. The value of a company’s excess assets is highest to an acquirer. When the acquisition closes, the acquirer gains complete control over the excess assets and is free to use them in any way. For an acquirer, excess assets are effectively a dollar-for-dollar discount to the acquisition price. For everyone else, the story changes. Owning a minority stake in a company does not entitle one to determine the use of excess assets or otherwise exercise control. Investors must accept the risk that excess assets will either languish on the balance sheet for years to come or even be squandered on ill-conceived projects or acquisitions. Well sure, if that $20 million is available to you. But try calling up the CEO and asking for your proportional share. You won’t get far. So how is an investor to treat excess assets? I argue for a “behavioral” approach, based on how a company has historically treated the excess capital it generates. Let me use an example. OPT Sciences Corp. manufactures anti-glare and other specialized glass products used to cover instrument panels in aircraft. The company’s products are used in the Boeing 777 and 737, as well as Gulfstream and Dassault jets. OPT Sciences has fashioned a very nice business in this niche. EBITDA margins have averaged 18.2% over the last five years, and net income and free cash flow have been positive in every year since 2003. For the twelve trailing months ended April 27, 2013, OPT Sciences recorded $1.25 million in operating income, or $1.61 per share. Weighing its consistent record against its limited growth prospects, an investor might assign a value to OPT Sciences’ operations of 6-8x operating profit, or $9.66 to $12.88 per share. Since this blog post is about valuing excess assets, it should be no surprise that OPT Sciences happens to be massively overcapitalized. At quarter’s end, the company held $10.62 million in cash and securities against zero debt. Even assuming the company requires cash balances of 10% of annual sales to operate, excess cash and securities amounts to $12.81 per share. The company’s share price mid-point is $16.13. At this point, many investors would conclude OPT Sciences is worth $22.47-$25.69, based on the value of its operations and excess capital. And it may be, to an acquirer. But it is likely not to you, or to any other minority owner, because it may be many, many years before that excess capital is put to productive use. OPT Sciences has little opportunity for growth investments, yet is unwilling to return excess capital to shareholders. The company has paid only one dividend in recent history, a measly $0.65 payment in December 2012. OPT Sciences is 66% owned by a trust that benefits the children of Arthur J. Kania, a businessman from Scranton, Pennsylvania. Because paying significant dividends would trigger tax consequences for the trust, it is unlikely that the company will make meaningful distributions in the near future. And because the trust owns 2/3 of shares outstanding, no outside investor can force the company to disgorge excess cash. Any would-be investor in OPT Sciences must be willing to purchase a large, unproductive heap of cash and securities alongside the attractive operating business. Because the company’s excess assets are completely unavailable to investors and will likely remain so, the excess assets are not worth their market value. But they’re clearly still worth something. After all, the trust could be dissolved or the company could be sold or the company could change course and declare a series of special dividends. Determining the fair value of the company’s excess assets is a matter of estimating the likelihood and timing of these possible favorable outcomes. Below are some example scenarios, followed by the present value of the company’s excess capital under each, assuming a 12% discount rate. Scenario 1 – Business as usual. Every five years the company pays a $1.00 special dividend, and is sold in 20 years for a price that includes the full value of its excess capital. In the meantime, the excess capital appreciates at 3.5% after-tax. Likelihood: 50%. Scenario 2 – Mr. Kania (who is 81) passes in ten years and the company is sold for a price that includes the full value of its excess capital. In the meantime, the excess capital appreciates at 3.5% after-tax. Likelihood: 35%. Scenario 3 – The company decides to distribute excess capital to shareholders in equal installments over five years, and continues as a going concern thereafter. Likelihood: 15%. The present value of the firm’s excess capital is lowest under scenario one. 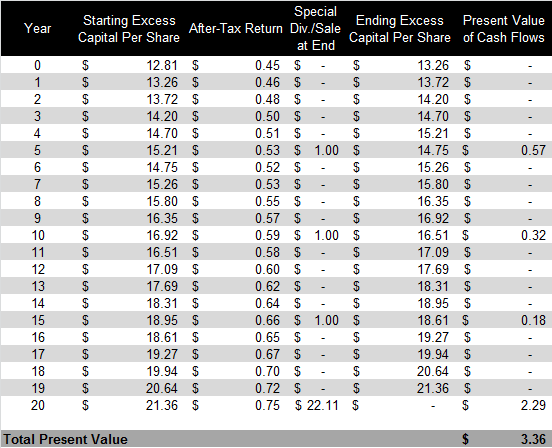 Because the full amount of the excess capital is not received for 20 years, its present value is only $3.36 per share. The longer a company fails to invest excess capital productively or distribute it to shareholders, the less valuable the excess capital is. Scenario 2 is somewhat better. Cutting the time it takes to receive full value for the company’s excess capital to 10 years nearly doubles the present value of the excess capital. Scenario 3 is by far the best for shareholders. Receiving all excess capital in equal installments over five years yields a present value of $10.23. Recalling the various probabilities I assigned to each scenario, the probability-weighted present value of the company’s excess assets is $5.32. Adding this figure to the $9.66-$12.88 range of values I assigned to the company’s operations results in a total value of $14.98-$18.20, neatly bracketing the company’s actual trading price. (I swear I did not work backwards.) Clearly, investors are following some process by which they are heavily discounting the value of OPT Sciences’s excess assets. The scenarios I used are completely arbitrary and are intended only to illustrate the process. A more complete set of scenarios might include one where the company is acquired within a short time, as well as one where the company squanders the excess assets completely. No matter how exactly they choose to do it, the point is that minority investors should carefully consider how and when they are likely to benefit from a company’s excess assets. Company ownership structure matters, as does a company’s historical capital allocation policy and current management’s intentions. What seems like a very under-valued company may not be. The one significant exception is a scenario where a company is capable of managing non-operating assets to produce a return that exceeds its cost of capital. For example, imagine a wholly equity-financed company with a cost of capital of 9%. If the company has a portfolio of stocks and is capable of earning an after-tax return of 9% on them, that company is doing just fine by its shareholders. However, if the company can only earn 6% after tax, it is better off divesting the funds and sticking to its core operations. The second scenario is far more common, as most management teams lack the talent to manage both their core operations and an investment portfolio. No position in OPT Sciences Corp.
12 Responses to What Do You Do With A Cashbox Company? Good post & very well explained. . Doesn’t have to be cash — could also be real estate carried at less than market, or “a gem” segment paired with loser segment. I actually disagree with this post, I understand your intend, but have a slightly different take. For any company (good or bad, asset heavy or light) minority holders have a legal claim on their ownership interest, but little hope of realizing anything. To take your thinking on this to the logical conclusion minority shareholders should only value companies based on dividends, the profits they take out of a company. Think about something like Berkshire Hathaway, they pay no dividends, have valuable assets and are a controlled company. Should minority shareholders discount the cash and securities because the company will never be acquired? If shareholders aren’t expected to ever realize the value of Berkshire’s assets, or receive then what do they own? Nothing more than a slip of paper that trades. I think where we differ is that a share is an ownership interest that has value regardless of what happens. Consider something non-investment, a piece of art, a recognizable piece. You might buy it and hang it on the wall, it throws off no cash, and you have zero intent of selling it. Say you are in a tight position and sell half of it to your brother. He comes over and enjoys it, and knows he owns a part of something valuable, even if it isn’t sold. The idea of discounting cash because a minority owner doesn’t have access has always been strange to me. If they don’t have access, and in theory it can only be unlocked by someone with access shouldn’t it be worth zero? This is essentially the same argument for any asset, unless it generates earnings, which generate dividends that minority holders receive they have no value. As you know I like cash box companies, I also happen to own OPT Sciences. I have two schools of thought on them. I think an argument could be made that they’re worth cash plus business value. The concern is obviously the family and their trust. But think it through, they have a foundation with the shares, what is the end game? This family clearly isn’t building a dynasty, the trust is a way to pass on ownership from the father to the two children. The children are in their 50s. The CEO is the husband of one child, the other child on the Board. So both children are involved, but also not operating the company day to day. What value do they receive from owning those shares? I think a strong argument could be made that we might see dividends when the father passes away because this is finally the kids chance to get a hold of the cash. While I can see the cash + operations value I’d also consider selling $18 or so. I ask myself how long I’m willing to wait? When I invest in companies with potentially long waiting periods I require a dividend, OPST pays none. Nate, thanks for the good comment. I have a few points in response. On the issue of companies like Berkshire Hathaway, I think companies like these fall under the exception I listed. I trust Berkshire to invest its cash and securities prudently and achieve a satisfactory rate of return, so they do not deserve a discount. I no not trust OPT Sciences to investment its securities at an acceptable rate of return, so I discount them. I also discount the mutual fund portfolio held by Monarch Cement, and the vast cash holdings at CIBL, simply because I suspect these assets will not be invested well enough to meet these firms’ cost of capital. As for your example of the two brothers and the painting, I agree that the painting has value to each, though it is not sold and produces no cash flow. This holds so long as each brother has a 50% interest. But what if one brother only holds a 25% interest? Obviously, that brother is hostage to whatever the other brother decides to do, whether it is to sell the painting outright, sell additional interests in it, or loan it to a museum. Say the painting is appraised at $100,000. The brother who owns 75% values his share at $75,000, but I don’t think the brother who owns 25% should value his share at $25,000. This is because he cannot exercise any control over the asset and is simply “along for the ride” with his brother. It is possible that the majority-owning brother will stick the painting in his damp basement and leave it there until it goes moldy. Because of this danger, the minority owner would be wise to assign a discount to his share of the painting. As before, there is an exception. If the brother who owns the 75% is an accomplished collector with a history of making shrewd transactions, the brother who owns 25% may consider his own stake worth the full $250,000 or even more, because he trusts the brother to manage the asset to its potential. This is starting to veer into embedded options theory. Say a man owns 100% of a company. That man also owns a valuable embedded option: complete decision-making ability over the company. This man can sell the company to another company, acquire or divest assets, form JVs, etc. Now let’s say this man decides to sell 10% of the company to another man. The acquirer now owns 10% of the economic value of the company, but 0% of the embedded control option. The 90% owner still exercises 100% control, and thus owns embedded decision-making option. This is why minority stakes are discounted. (3) you must rely on the business, not some other secondary market participant, for your returns (intrinsic). “Suppose the stock market closes down for 10 years” — that’s the value investor’s test in a nutshell. Absent a known catalyst, one-legged cash-box investing can’t pass that test with ease. The art example is problematic because, like gold, the value of art is extrinsic. Berkshire is about future expected dividends: everybody “knows” that Buffett/successor will return cash when it stops being able to reinvest at above-market rates. Berkshire is an earnings growth story with dividends as the epilogue. Excess cash on the balance sheet is , at best, like an unsecured long-dated zero-coupon bond in a 10% inflation environment. Would anyone pay par for that? So all of those investors in BRK who invested in the 1980s were investing with the hope of future dividends? What if the company never pays a dividend? My house doesn’t throw off dividends, yet it has a value. Investors buy and sell non-income generating real estate all the time. Some is with the hope of expected income, but not always. We fundamentally differ on this. I believe things have a value even if they don’t throw off income. Look at Craigslist, you can find cars, boats, rv’s etc on there, none of them generate income yet they are all valued. Only in the public markets do investors believe $100 is worth less than $100. So far I’ve successfully used this to my advantage, I hope public investors continue to believe this because I’ll continue to make money on it. One more thought, look at private markets and talk to a business broker. Ask them if they can find you a business that’s cash heavy, but say you only want to pay 75% of the cash value. You’ll be lucky if they don’t hang up on you. If intrinsic value is what a well informed buyer would pay in a privately negotiated transaction why not look at things that way. A company’s assets (non income generating) such as buildings, land, vehicles would be valued in a transaction, so would cash. I believe cash is always 100%, if you made the argument that receivables or inventory should be discounted then I would agree, same with land and buildings, they’re sometimes overvalued, but cash is cash. For anyone buying a business in whole, excess cash is certainly worth 100%. After all, they’ll be free to direct it however they wish. It’s the functional equivalent of buying someone else’s checking account. That sort of analysis is wholly appropriate for private equity acquirers and other control buyers, and it is one reason why mergers and acquisitions almost always take place a a premium. Control has value. However, in any instance where another party has control over assets, the value of those assets must be discounted. We can make this discussion a little simpler by discarding the existing operations aspect entirely. Let’s say I have a briefcase containing $10,000 cash. I tell you I plan to invest it in a profitable business venture, then I offer to sell you a 10% stake in the briefcase and its contents right now. What would you pay for it? $1,000? I hope not. Though you own a 10% economic interest in the venture, you have no control. I could sit on the cash for five years and then return it, costing thousands in missed opportunities. Or I could invest the cash in some hairbrained venture that is doomed to fail. These are the same risks you run when investing in the company that holds excess cash. As a minority investor, you have no say over how or when the cash is used. Because of that risk, a discount of some sort is appropriate. Many non cash flow producing assets have value, but that value is still based on receiving something. Vehicles and artwork produce enjoyment and pride of ownership. Residential real estate provides some of the same, plus it acts as a substitute for paying rent. But minority ownership in a non cash flow producing asset should be discounted just like it should be with securities. Not having the freedom to manage the asset as one pleases necessitates a discount, unless one is incredibly confident that the majority owner can manage the asset well. I would like to point out that the Berkshire Hathaway example is not pertinent in this case because BRK enjoys a cost of capital (due to vast insurance operations that average, over time, a combined ratio of 100% or less, creating a large amount of cost-free “float”) that is much lower than majority of companies. Thus, it makes sense for BRK to invest in non-core businesses/securities with excess cash because those non-core businesses/securities almost always generate a higher return than BRK’s cost of capital. This is why BRK likes purchasing low-risk investments using leverage. Very few other companies possess this competitive advantage, even other insurance companies. Berkshire Hathaway does enjoy unique advantages giving it a low, low cost of capital, but there are other firms out there that have successfully managed non-core assets. That list would include Leucadia, Power Financial in Canada, and (historically) Teledyne. Like I said, they’re rare, but some management teams have real investing talent. I would even submit that The Marketing Alliance, which I have profiled, has done very well by investing beyond their core operations. I enjoy reading both Nate and your web sites, but I think I take a middle position (leaning toward Nate although I usually invest more like “otc” ). I don’t use the same discount rate on cash as I would the business. The risk is clearly different. Of course I don’t want to only earn 6% per year over the next 20 years either. The key is figuring out the probabilities so you use the right discount rate. Each situation is unique. As Nate noted he would consider selling at $18, which is well below 8x earnings plus cash. It is pretty low risk/decent return to buy at 1-2 earnings net of cash (or less) and sell at 4-6 times earnings net of cash. He doesn’t have to be greedy and does quite well. Enjoyed the write up. I hope both of you keep it up. Just saw this post/discussion. I agree with Nate, the value of cash is always 100% so when determining the intrinsic value of the company’s assets, cash should be added in 100%. Not much debate on that. This of course does not mean the stock will not trade at a discount because the minority owner needs to earn a certain IRR knowing they will not get cash/assets for a number of years. This is where great opportunities can be found. The stock price will reflect a discount based on the required return of buyers and sellers that want to sell must accept less than full price. Syndicated real estate partnerships consistently trade at discounts to NAV of 20 – 30% to reflect the risk/IRR of not being able to get to the assets, even when paying significant distributions. These discounts disappear when the partnership gets closer to liquidation. The discount is known as the minority interest or lack of control discount and is very real.